Kate and I are still nursing the colds we have had for a few weeks. We had been recovering slowly, but steadily, until this week. Yesterday and today, I have been much better, but Kate is worse. The past two nights she has coughed a good bit. She still seems to feel all right. I am glad about that. It looks like a quiet holiday weekend for us. That is probably a good thing in terms of our colds. I haven’t even made reservations for a New Year’s Eve dinner. I will probably attempt to do that today. Tomorrow afternoon we have a drop-in to celebrate the 93rd birthday of a woman with whom we sit at our musical nights at Casa Bella. They are also celebrating the baptism of a new baby in the family. I am planning for us to make that unless our colds make that unwise. Today was the first time we have had a sitter since before Christmas. We had missed three days while we were in Texas. I wondered if this would present a problem for Kate. I should not have worried. When the sitter arrived, Kate saw her pull into the garage as she (Kate) was about to go outside. She said, “Who is that?” I said, “That’s Mary. She is going to be here while I go to the Y.” Kate greeted Mary warmly as she entered the door. They both went outside while I got a few last-minute things taken care of before leaving. As I drove down the driveway to the street, I stopped where Kate was standing in a flower bed with Mary. She (Kate) asked where I was going. I told her the Y. Then she pointed to Mary, smiled, and said, “She’s my guard. I can’t get into any trouble.” I waved goodbye. Once again, I felt good that the sitter is working out as I had hoped. Travel has been a significant part of our marriage. When our children were 4 and 2, we made our first trip to Europe. We did it “on the cheap” as they used to say. We didn’t stay in a single place that had a full bathroom in our room. We always had to go down the hall to bathe. The remarkable part is that our son was still in diapers, and that was before disposable diapers were popular. Kate washed diapers by hand for six weeks. We spent one summer in South America when the children were 6 and 4. That was a time when I was involved with a program called Partners of the Americas. The children don’t remember much about it, but it was a great experience for us. When the children left home, we began to travel a little more. We stepped that up a bit after Kate’s diagnosis in 2011. We knew, of course, that it couldn’t last. Our last international trip was to Switzerland in 2015, not including a Carribean cruise in January 2016. These last two trips signaled the end of our trips out of the country. We have continued to travel longer than I expected when she was diagnosed. It seems like each trip we take now makes me believe that we are approaching the end of all but short car trips. That would include the trip we just completed. Kate, of course, does not remember anything about the trip; however, I am sensitive to the challenges it introduces for her as well as for me. I am determined to keep it up as long as it seems wise, but we are much closer to the end. Even before our recent trip to Texas, I believed that would be our last. I wasn’t really sure we would make it until the past few months. Before we left, I was disappointed that we hadn’t been able to spend more time with Kate’s brother Ken, and his wife, Virginia. I began to think of making another trip back sometime in the spring. I’ve already mentioned this to them and to our son, Kevin. I would make it a combined trip to both Lubbock and San Angelo. One never knows exactly what lies ahead, but I believe it is important to make this one. I also believe we may be able to make an auto trip to Memphis to see our daughter and her family. That may also be in the spring. That is as far out as I am willing to project at this point. I’m not ready to hazard a guess as to how long we will continue our visits with friends in Nashville. I intend to keep visiting as long as it is possible. I think those are important for Kate as well as for me. After six days on the road, Kate and I returned to our normal routine today. It felt right. It wasn’t completely normal. I actually got up over an hour later than I often do, 7:15 compared to a normal get up time between 5:30 and 6:00. I woke up earlier at 4:20 and 6:00 and decided to sleep a little more. That decision was prompted by the fact that I am still nursing a cold that has been hanging on far longer than usual. I felt like this was a good day to take it easy. I didn’t even take my morning walk. That was partially influenced by the temperature around 30. Kate was up before 8:30 and ready for Panera about 9:30. We were there an hour before she was ready to come home and wanted to work outside even though it was still 36 degrees. After she had worked for an hour, I suggested we go to lunch at Carla’s Trattoria. We go there almost every Tuesday. Even though we had eaten well, actually too well, over the holiday, we splurged and finished our meal with some of Carla’s homemade salted caramel gelato. From there we dropped by the church to make a last-minute payment on our church pledge and then by Walgreens to pick up a couple of prescriptions. When we got back home, Kate told me she wanted to go back outside. I told her that would be fine. Since it was then 39 degrees, I thought maybe she might not be out too long. I underestimated the attraction of the yard. She was outside over three hours and happy as a lark. She and I have often said that working in the yard is her therapy. There is more truth to that than we originally believed. She is able to work for hours though not usually with weather in the thirties. I think I mentioned in an earlier post that she had wanted to “pull leaves” at Kevin’s house. On two occasions she actually did pull a few as we walked from the car to the house. We finished the day by going to dinner at one of our other local favorites. We enjoyed our dinner and then came home to relax. Kate got ready for bed, and I watched the PBS Newshour that I had recorded earlier. It was a good first day home. I am glad to report that our travel home yesterday was uneventful, that is, we had no trouble at all. Anytime we are facing activities or appointments that have definite time demands like airline flights, I worry a little about making sure Kate is ready. It may seem strange, but we actually encounter fewer problems like that now than in the past. I find that Kate really works harder to get ready than she used to. That is part of a general pattern. It is as though she recognizes that she is not in control and feels the need to work harder. I don’t mean that she appears frantic about it. It is just that she seems more attentive to doing things “the way they should be done.” For example, until Alzheimer’s began to take its toll, she always made up the bed shortly after she got up. Over the years I have heard her say, “My mother taught me to always make up the bed.” She stopped that for quite a while. Within the last six months she has begun to partially make it up once in a while, not daily and not completely. She pulls the covers over the bed and throws the pillows in their approximate places. She also hangs her clothes up more regularly though she doesn’t hang them in what I consider to be the “proper places.” Although it saddens me somewhat to see that she has to work hard to do the right thing, I believe it is a good thing that she is taking more responsibility. She still wants to be independent. I want that to continue. She was still sleeping soundly yesterday morning at 8:15 when I woke her up. Kevin came over for a short visit before we went to the airport. She didn’t want to get up, but she did without a complaint. Kevin dropped by at 9:15. She was ready, and I had everything packed. That gave us a brief time to be together before leaving at 10:00. The rest of the trip went smoothly. We arrived in plenty of time. I had been a little worried that we might be rushed, but we had sufficient time to gas up the rental car, return it to Avis, check in, have lunch, and still be early enough to have some waiting time before boarding. This eliminated any potential stress that might have occurred otherwise. We stopped by our favorite Mexican restaurant on the way home from the airport. Our server last night was a comparatively new one. It turns out that she is from Venezuela. I had a nice conversation with her entirely in Spanish. We told her that we had visited Venezuela many years ago. I think she liked that. We also bumped into an acquaintance from the Y. He was with his wife, children, and grandchildren. We had a nice conversation with them as well. For me it was just another reminder of the value of eating out. Kate got into her night clothes pretty quickly and right into bed. She worked puzzles on her iPad for well over an hour before calling it quits for the evening. She and I both slept well although she coughed a good bit during the night. She seems better this morning, but we are both still struggling from the cold we got three to four weeks ago. We got right back into our routine this morning. We made it to Panera about 9:30. Kate was ready to come home at 10:30. After a short break, she wanted to work in the yard despite the fact that it was 36 degrees. At least the sun is shining brightly. She has been out there almost an hour. I am about to call her in so that we can make our way to lunch. Over the past few years I have come to recognize the value of a routine for Kate. As someone with a touch of OCD, I have always liked routine, but that is something that does not come natural to Kate. As I have assumed a greater role as the person in charge, I have guided us into a regular daily pattern of activities. That involves letting her sleep as long as she wants. Learning very early that she likes to get a change of scenery, I started taking her to Panera to get a muffin. This soon became a habit that she latched on to with ease. She likes getting out of the house. She likes the muffin, and the bonus is the social activity there. She doesn’t like to stay any one place for long whether she is at home or someplace else. If we get to Panera early, we are likely to get back home for a break before lunch. If the weather is agreeable, she will work outside until I let her know that it is lunch time. I established lunch to match my own preferences. We go anywhere between 11:30 and noon, sometimes slightly later. After lunch, she is likely to go back outside. She used to stay out as long as three to four hours. Nowadays, she is not outside longer than an hour and a half to two hours. That often leaves a span of time during which she likes to leave the house again. At first, I took her back to Panera. More recently, I have sometimes taken her to Barnes & Noble. We go to dinner between 5:30 and 6:00 and are usually back home between 6:45 and 7:15. Then comes the most relaxing part of the day for both of us. We go back to our bedroom. She usually gets ready for bed and takes a seat in her chair and works on her iPad. I sit in mine and watch the PBS Newshour that I record every night. Anywhere between 8:00 and 8:45, Kate is ready to get in bed. Sometimes she continues to work on her iPad in bed. Other times, she puts it up and goes to sleep. My point is that this routine seems to minimize and relieve the boredom she feels if she spends too long at one task. That is especially true because there are so few things she is able to do on her own. I can easily understand. If I could only work on my iPad and go outside to pull leaves off the shrubs, I would be bored as well. It is remarkable to me that she is able to spend so much time on her iPad. It is only possible because we are changing locations throughout the day. This brings me to comment about travel. At home the schedule takes care of itself. She gets along pretty well. When she is bored, we move to something else. That seems to work very well. When we are traveling to visit family, the routine is different. Often there is no set routine because our time is viewed as an opportunity to simply enjoy time together. The problem for her is that she is unable to fully participate in most of our group activities that involve conversation, games, or things like watching a football game. This brings me to this afternoon. We didn’t arrive at Kevin’s house this morning until it was getting to be time for lunch. All of us went out for a nice lunch and came back to the house. I was hoping that Kate would take interest in a game Kevin’s family had learned from Kate’s cousin, Tina. She was never able to become engaged and went into the family room to work on her iPad. After playing the game a while, I went in to check on her. Her look conveyed she wanted to move on. I’ve learned to recognize it at home, at Panera, Barnes & Noble or visiting family on holidays. I decided it would be best for us to leave and took her to Panera. She was just fine. Before we were there an hour, she gave me the same look. I asked if she would like to return to the hotel. She did. We’ve been here about forty-five minutes. A few minutes ago, she closed her iPad and is resting on the sofa. She asked me not to let her go to sleep. We will leave soon for Kevin’s and then go to dinner. I have heard other caregivers talk about the challenges of traveling with their loved ones. We have been very fortunate to travel as long as we have, but now I see that we are approaching the time when that will be a thing of the past. It is hard on her and demands a lot of me to watch out for her. It is also very confusing for her. She still is not sure where we are. Today at Kevin’s, she pulled away for a moment and asked, “Where do they live?” I told her once again that they live in Lubbock. Tonight at their home, she asked, “Who lives in this house?” I told her that Kevin and Rachel live there. As she was getting ready to turn out the light and go to bed, she asked, “Where is this?” I asked if she meant the city. She said yes. I told her again that it is Lubbock, but that she would not have to worry about where she was tomorrow when we were back home. We had a very nice Christmas Day. It was special in several ways. This was Brian’s first Christmas at home as a college student. It was also the first time that Kate’s brother, Ken, and his wife, Virginia, had joined us for Christmas dinner. Rachel’s parents, Linda and Scott Livingston, who live in a small town outside of Lubbock also joined us. It was hard for me to get out of my mind the thought that this might very well be the last Christmas that Kate and I will be here. As noted in my earlier posts, the way things are going so far I suspect it will not be possible (or wise) to bring her back two years from now. I am not even sure that we will make it to Memphis to be with Jesse’s family next year. My only regret is that we didn’t get to spend more time with Virginia and Ken. I’m already thinking about the possibility of another trip to see them in the spring. It is very difficult for Kate to follow what is happening in a group situation like this. She responds by being quiet and tuning out on much that is going on. She continues to have difficulty remembering that we are in Lubbock. She pulled me aside at the gathering today to ask, “Where do these people (our son and his family) live?” Although she doesn’t say much, I do think she enjoys being in the company of family, especially for Christmas. We started the day earlier than previous days. Kate was ready for breakfast by 8:00. I had brought breakfast back to the room for myself a few minutes after 7:00. We went back to the breakfast area where Kate had some juice and yogurt. We were there about forty-five minutes before she wanted to go to Panera. We did, but it was no surprise that they were closed. We came back to the hotel until time to leave for Kevin’s house. We were there just before 10:00. Everyone chipped in to make the Christmas dinner. As usual, we had plenty to eat and good conversation. Kate’s brother and his wife as well as Rachel’s parents left not too long after dinner. We spent the remainder of the day relaxing. Kate worked on her iPad while I watched a little football. We also played a game or two. Kate didn’t participate in the games. She was happy with her iPad. Before coming back to the hotel, we enjoyed some of the leftovers. It was a nice Christmas. It has been another nice day with our son’s family. It is Sunday, so they went to church this morning. I chose not to go thinking it would be good to let Kate get up leisurely and have a relaxing morning. Kevin called us after church, and we met him and his family at a local hamburger place for lunch. Then we came back to the house for the afternoon. We watched a couple of football games. Kate worked puzzles on her iPad. She did rather well, but I could tell she would have liked a change of scenery. When I asked if she would like to go back to the hotel, she said no. Thus we stayed at the house until time to leave for their annual Christmas Eve church service. We attended with them as we have done in the past. We came back to the house and had chili that Rachel had made. Then we came back to the hotel where Kate quickly got ready for bed. She didn’t even work on her iPad and was asleep in no time. Despite having a nice day, Kate continued to be confused about where we are. I know she must have asked me almost ten times. That began this morning when we went to the car to go to Panera. She asked, “Where are we?” She asked again as we were leaving and also as we were leaving lunch. When we got back to Kevin’s house after lunch, she got out of the car and started pulling leaves from a shrub in front of the house. She had pulled only a few when I told her I thought we should go inside. Yesterday afternoon at Kevin’s she had said, “I can pull a few leaves.” It was a statement but really a question. I told her this was Kevin’s house and that might not be a good idea. She accepted that without a problem. Her mood makes me think that she is recognizing her loss of memory. 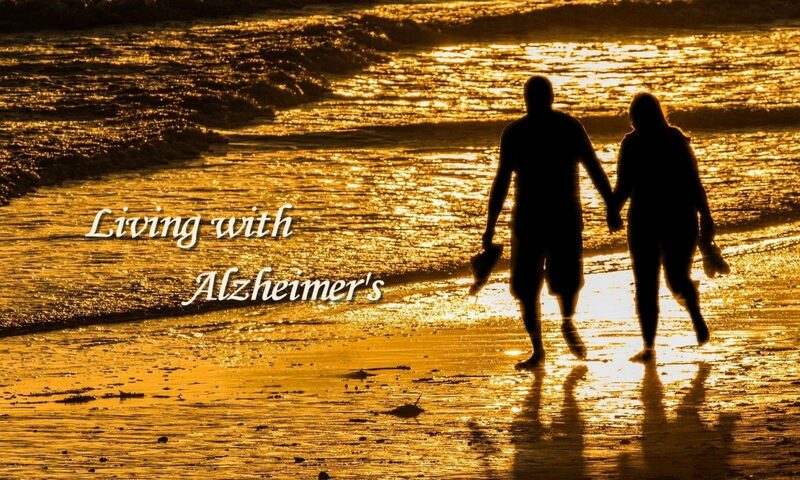 I doubt that she is associating it with her Alzheimer’s, but I believe she knows something is wrong. She is feeling more dependent on me. I think traveling brings this out because she has no idea where we are or where things are around the hotel room. Several times she has asked me where the bathroom is. Since I have packed her clothes, she has no idea what things I have brought for her, or where they are. There is good reason she is confused. My deeper concern is that this confusion is not just a result of being in strange places but that it represents a sign of further decline. I fear what things will be like in the next few months. I hope my fears are unfounded.